6. This country of ours. 5. 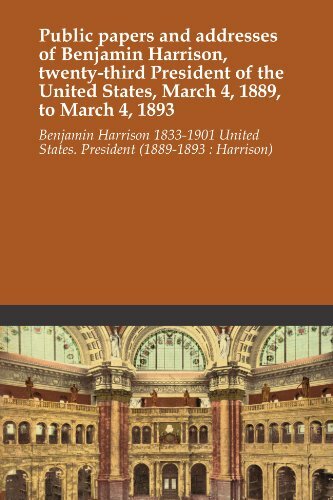 Speeches of Benjamin Harrison, twenty-third president of the United States; a complete collection of his public addresses from February, 1888, to February, 1892 .. The American Presidents series is a nice set of short bios of many of our Presidents. Most are well done, providing brief entree to the lives and performance of our chief executive. 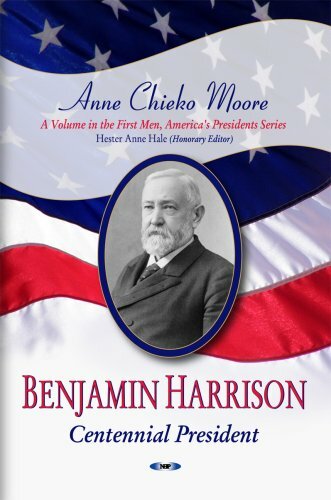 This volume examines Benjamin Harrison, the grandson of President William Henry Harrison and one of those who became president while winning fewer popular votes than his opponent. 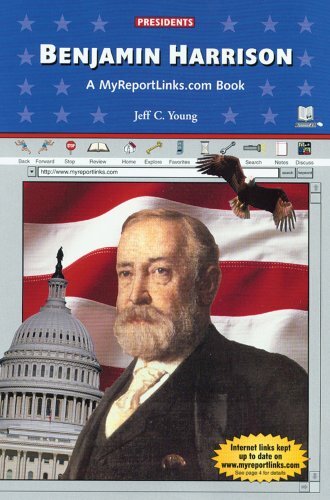 The book begins with his youth and his Civil War experience. He was one of the many Republican presidents in the latter part of the 19th century who had served during that bloody conflict. He entered the bar in 1854 and married Caroline. His law business languished; he became interested in politics. Thus began his career, although he was not always successful in his elections. The war intervened, and Harrison became an officer. After the war, his legal career became lucrative. However, politics beckoned and he became a figure in Republican politics in Indiana. He served in a variety of roles, before being nominated for President in 1888. He won by collecting more electoral votes--but fewer popular votes--than the incumbent, Grover Cleveland. His presidency was a vigorous one--both domestically and in terms of foreign policy. He hewed to a strong tariff policy, but one made more flexible for bilateral negotiation with other countries. He was open toward labor and was dismayed by the withdrawal of voting rights for southern blacks and fought hard (and, in the end, unsuccessfully) to address that and restore voting rights. In foreign policy, with James G. Blaine as his secretary of State, he played a strong hand, becoming very much involved in development and implementation of foreign policy. He did not triumph in his quest for reelection, as Grover Cleveland won back the presidency. Thereafter, he became once more a high profile attorney. The book does a nice job of depicting his final years and some internal family turmoil. Another good entry in the series. For me, I prefer longer and more detailed biographies, but this will serve well those who prefer something accessible and brief. 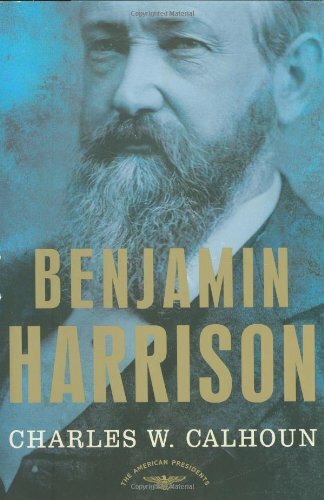 Sadly for Benjamin Harrison he is either remembered for being sandwiched by Grover Cleveland or for being the grandson of a president. Charles Calhoun does a great service by demonstrating how Harrison was a hands on, hardworking individual who did more in one term than Cleveland did in two. He is presented as the rare break in the laize-faire Presidents of the late 19th and early 20th Centuries who dared not to buck the power of congress. Calhoun does a remarkable job demonstrating that Harrison is a man who worked for all he got in life and never took anything for granted. He was the last president until JFK to pay more than lip service to African-American and he was aman who while holding to his beliefs, was fair minded enough to try and see the other side.In some sense it is a shame that he never served that second term. It would be easy to see he could have done better than Cleveland. 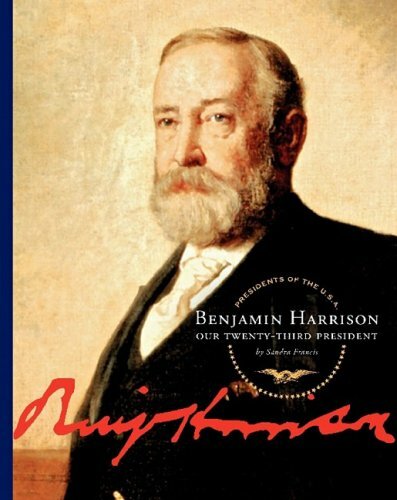 Benjamin Harrison, like several other presidents during the post-reconstruction, gilded age, served only four years as president. He was also only one of three presidents--the second at that time--to win election while losing the popular vote to Grover Cleveland in 1888. He was nonetheless a rather activist chief executive, securing important, or at least controversial, passage of legislation addressing the tariff, the currency, and regulation of the emerging corporate "Trusts". Harrison also endeavored, less successfully, to pass more robust election reform for African Americans in the South. While seeking the maintenance of a protective tariff for American industry and laborers, Harrison nonetheless also sought lower barriers for some imports as a means of increasing the country's exports. This limited "free trade" reciprocity with the countries of Latin America was rescinded by Grover Cleveland and the congress that succeeded Harrison, but serves as a model, for good or for ill, of the more globally oriented country and economy that would reflect later years and presidents. Harrison's legislative and executive activism, combined with sectional and economic divisions, however, spelled doom for Harrison's, and the Republican Party's, fortunes in the off-year elections of 1890 when the Democratic Party swept to landslide control of congress. While Harrison successfully fought off the mechanizations of long time Republican leader and his own Secretary of State James G. Blaine for renomination in 1892, Harrison went on to not only lose the presidential contest to the man he had defeated four years earlier, Grover Cleveland, but also lost his wife, Caroline, to complications from Tuberculosis, weeks before election day. Harrison's last two years in office witnessed the infamous killing of Indians at Wounded Knee, which ultimately proved to be the closing event of the Indian Wars. In Harrison's final months, the economic elite--including American business owners--revolted against the royalty who governed the Hawaian islands, spawning the Harrison administration to prepare for the annexation of the future 50th state. The annexation of Hawaii was negated by Cleveland and the new congress, however, when concerns over American involvement in the "revolution" surfaced. Harrison returned, but did not retire to, his family home in Indianapolis, where the former president again took up the practice of law. As an attorney, Harrison represented the Latin American country of Venezuela in a losing cause with Great Britain over the proper delineation of the former colony's land boundaries. Harrison did not go out gracefully in a political sense. He resented his eventual Republican successor, William McKinley, for having allowed himself to be nominated in 1892 at the Republican convention. Harrison also later opposed McKinley's policies in the Phillipines and American expansion (despite his administration's support for annexing Hawaii) policies more generally, and after 1893, did not campaign actively for his party or its presidential candidates. Nor did Harrison go out gracefully on the domestic front, at least from the persective of his two children, as the former president remarried his late wife's niece, Mary "Mamie" Dimmick, who had long served as an aid and companion to Harrison while his wife Caroline lived (although no valid evidence existed of an affair between the two during those years). The marriage alienated Harrison from his son Russel and daughter Mary. Harrison had another daughter, Elizabeth, through Mamie but would die five years later, in 1901, from pneomonia. Calhoun does a good job bringing Benjamin Harrison and his times to life, portraying the post-reconstruction, gilded age as more politically intriguing and contested than normally regarded, at least in comparison to the ideological struggles of the Civil War era that preceded it and the progressive-New Deal era that succeeded it. Calhoun could probably have provided greater insight, particularly as to its geographical aspect, on the electoral upheaval in 1890 when the Democratic Party returned to power in greater numbers than it had witnessed since the time of Andrew Jackson. But Harrison's evaluation of the electoral results--that they represented more of a hyccup in electoral fortunes than a long term realignment--ended up being born out by the equally cataclasmic Republican victories in 1894 and 1896 and the long Republican hegemony from McKinley to Taft. 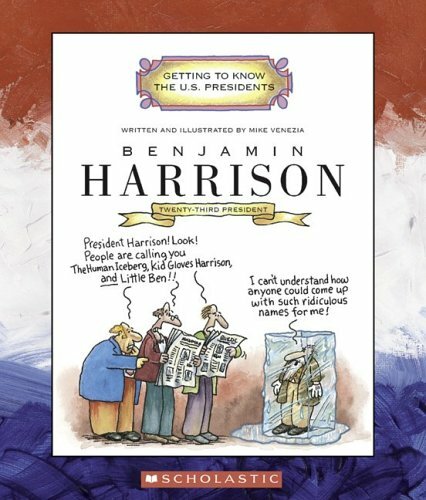 I learned something from this book.I did not actually know too much about Ben Harrison but this short biography sure did teach me something about him.Harrison was a one term President who actually accomplished something in his four years.He fought the free silver coinage act, passed the Sherman antitrust act, lowered tariffs, but did not extinguish them, and worked for voting rights for black Americans.He also did alot of his own foreign relations, since his Secretary of State Blaine was constantly ill.He was a diligent hard worker who would shame some of our lazier presidents. 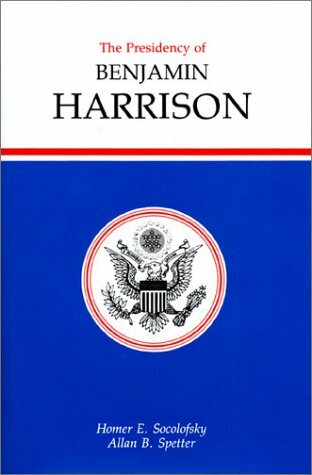 Due to all this activism, Harrison lost the mid term Congressional elections, and ultimately his office.He didn't seem to mind, because he thought he would be happier back home in Indianapolis.I enjoyed the author talking about Harrison's personal life.He married again after he left the White House.A nice biography of a little known President. 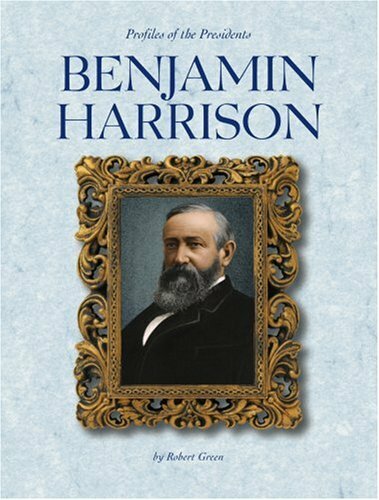 This book is an excellent summation of the Benjamin Harrison presidency and covers the tumultuous changes that were occurring in the 1890's.Harrison was the last of the civil war presidents to achieve the presidency and led with a military like clarity that was reminiscent of Grant.Harrison broke the rules of Gilded Age politicians by appointing a cabinet of unknowns and not answering to party machines and stalwarts alike.He was the true commander in chief managing the army at a time during the end of the Indian Wars and Wounded Knee as well as beginning the building of a navy that would allow McKinley to begin an American "empire".Benjamin Harrison also served as his own secretary of state due to the illness of Blaine allowing Harrison unprecedented control that Gilded Age presidents did not typically have.Overall this book hones in on these topics and more following the Harrison presidency and how it impacted America. It is an excellent and brief summation of an important Gilded Age president and well worth the read. 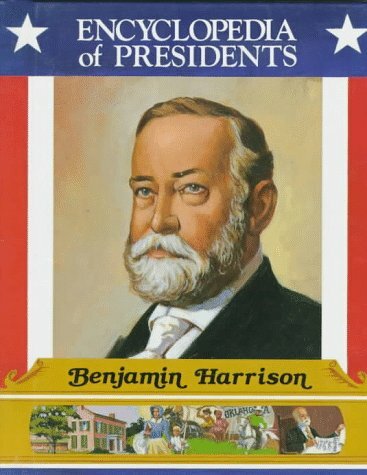 Not only is he one of America's lesser known presidents, Benjamin Harrison is not even the better known of presidents named Harrison. His grandfather, William Henry Harrison, bears the name most Americans remember if they recognize the Harrison name at all. Old Harrison made his name as a dashing military hero; his grandson decades later would fight well under Sherman and attained the rank of brevet brigadier general, but as events would unfold, the country was awash in brevet generals in 1888. The University Press of Kansas began its presidency series with a treatment of George Washington's tenure in 1974, and as of this writing has brought the series as far along as the presidency of George Bush, Senior. A survey of the series indicates that coincidentally or not, all the volumes to date are remarkably similar in length, just under three hundred pages in most cases. 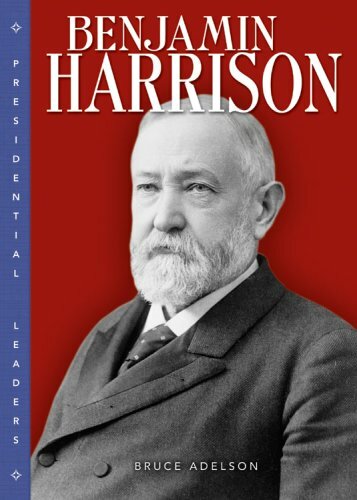 Critics may argue that presidencies such as Lincoln's or FDR's might merit more ink than, say, Franklin Pierce or our subject at hand, Benjamin Harrison. Having read several volumes, I would say that the success of the series to date has been bringing the achievements of the lesser known presidents to more public prominence. 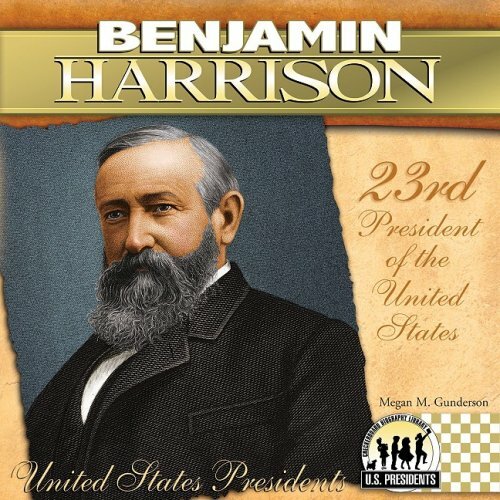 Presidents such as Hayes and the second Harrison have done better by this series than have Nixon or Kennedy, whose volumes naturally have had to compete with the products of the likes ofSorensen, Manchester, Caro, Dallek, etc. The University Press has attempted to stay focused upon the presidencies themselves, which has had the effect of dulling some of our more charismatic leaders and their colorful pasts. [One wonders how the editors will come to grips with Monica Lewinski, when that day inevitably arrives. ]Diminishment of charisma is not a problem when treating of Harrison. He was Robert Taft before there was Robert Taft, a tweedy Midwest lawyer who successfully put the excitement of war behind him and nurtured a competent, unflappable, and predictable personality. He won and lost a senate seat prior to the Republican convention of 1888, and became an eighth ballot nominee when it became clear that his party's reigning Hamlet, James G. Blaine, would not run, apparently for reasons of health. Harrison's pragmatism led him to undertake the formation of his cabinet as an exercise in party unity. One can probably argue that Harrison's presidency never really survived the selection process, for Harrison, in a gesture of perhaps insecurity and stubbornness, refused to allow state party bosses their traditional say in cabinet appointments. Harrison chose a cabinet of men like himself: Midwesterners, brevet generals, Presbyterians. And, until the very last moment, no Blaine. Maine's favorite son assumed himself a shoo-in as Secretary of State. Blaine, a master of denial whose illnesses compromised his effectiveness in Harrison's cabinet, and Mrs. Blaine, put out by her perception of Harrison's lack of reverence for her husband, were simply two of many disgruntled forces in the Republican Party. That the Democrats would storm back in the 1890 congressional elections--aided by a distinct lack of Republican enthusiasm--was predictable early in the Harrison presidency. Harrison's domestic policy prior to 1890 focused upon issues which, to one degree or another, had been problematic since the Civil War. Tariff restraints, currency debates, civil service reform, civil rights, management of western territories, Indian affairs [including the battle at Wounded Knee], immigration, labor issues and safety were regular staples of government debate. With the House and Senate nearly evenly matched till the 1890 elections, there were no spectacular federal breakthroughs for which Harrison could claim victory. The authors do note that the president deserves more credit for his efforts to establish federal land reserves in the teeth of opposition from the lumber industry. It is also worth noting that more states were formed under Harrison's administration than under any other president; the northwestern alignment of states, as we know them today, took shape with apparently minimal controversy. Harrison turned his attention to foreign affairs in the last half of his presidency. By 1890 it was beginning to dawn upon politicians of both parties that affairs in Central and South America were taking on an added importance in this country's commerce and defense. For most of the century America's chief concern had been the designs of foreign powers from across the sea. Now the necessity of an ocean-to-ocean canal involved this country more deeply into the relations of South American countries themselves. Harrison was not the first, and certainly not the last, president to assert American hegemony on the South American continent, and his warlike gestures toward Chile were of a cloth with McKinley and certainly Roosevelt, who admired Harrison's belligerence. Harrison also saw the importance of American military and fueling bases in the Pacific in the face of growing German interest in the region. It is not clear that Harrison fully appreciated the unfolding of the new international military order in the way that an Alfred Thayer Mahan or Theodore Roosevelt would, but he can be commended for fidelity to a policy that made the American position in South America and the Pacific much more tenable. And, it should be noted, Harrison conducted his foreign policy without the help of Blaine, who was too ill to assist and too proud to step aside.